I have been trying to get some quilting done on the quilt frame. Yesterday I only got 1 threaded needle used up. Someone (Teddy) does not like it when I work on the frame. He thinks something is wrong because I have my back to him, and we are not in the room he thinks we should be in. He wants things to always be the same and thinks that it is his job to make me go back to the hoop where he expects me to be. He also thinks he is in charge of the house which I guess in some ways he is. I might try to move the frame away from the wall so I can face out and see if that makes him more happy. Be that as it may this is all I have done so far. I am just doing very simple fans, with no marking so they are a free form pattern that I think goes with the top. Some day it will be done. So quilting is not always fast, but it is always fun! 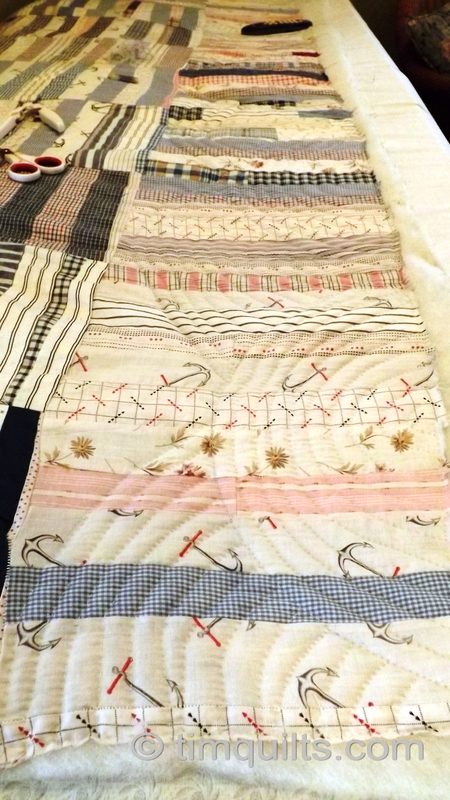 This entry was posted in Quilts and tagged baptist fan quilting, hand quilting, Quilts, whole cloth quilt. Better listen to Teddy, he is a quilt whisperer in disguise. He looks like a pure bred, but maybe he’s got a bit of border collie in him. Could you talk about how you mark a quilt with a grid? Do you use the June Taylor grid marker, for example? 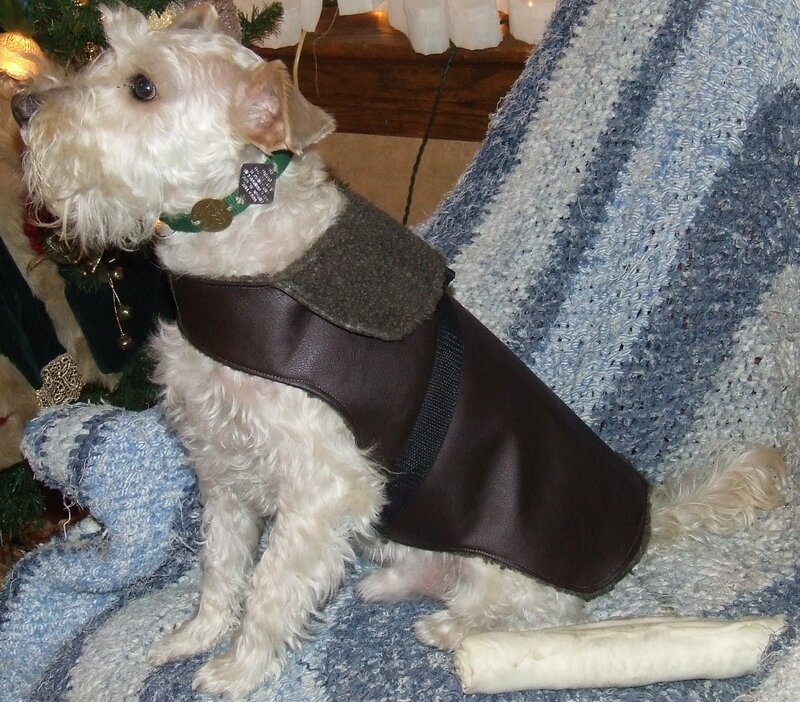 I used to be owned by Wire-Haired Fox Terriers and believe me, they notice everything! If you moved a piece of furniture or added a vase of flowers when they were out of the room, that was the first thing they noticed. You are messing up Teddy’s routine! exactly!….his routine is very important to him! Tim, you are such an inspiration to me. I have hand quilted very few quilts and although I love the look, I found it to be sooo time consuming. But lately have gone back to it and am now working through two quilts that I purchased some time ago. One had been started by the maker and the other is a top with plenty of seams. After reading your blog, I purchased some of the Bohin needles you use and I love them. They do not bend or break as my old brand did. Found them on line and ordered one packet, but will be ordering more. I mostly work on a hoop while watching (actually listening) to TV – I guess around two hours a night. 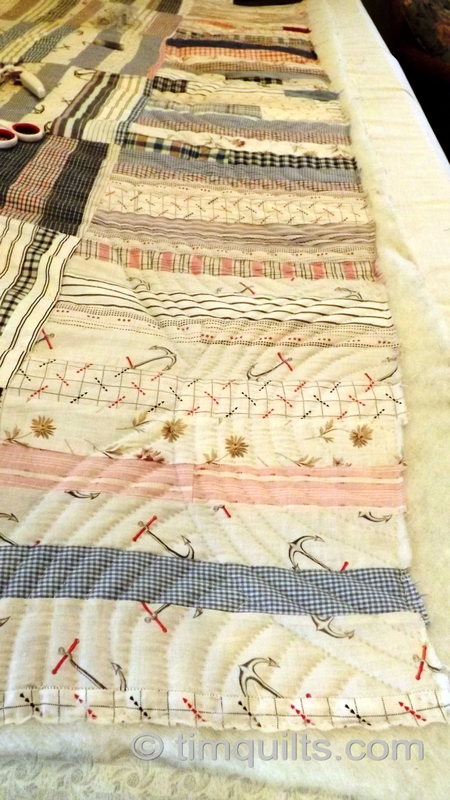 The batting in the quilt that had been started by the maker has begun to separate and am having a time with it – some areas are “unbatted” while others are lumpy. Didn’t discover this until I was way deep into the quilting, but I will persevere. Am looking forward to your info on marking. 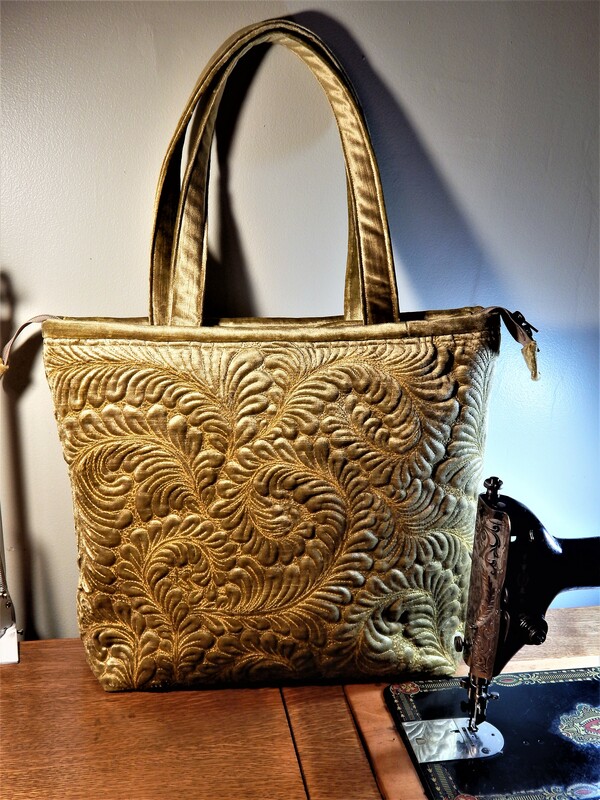 Hi Terry….glad to hear that you are liking the needles…the right tools really do make a difference!….keep at those projects..I always feel good when I finish up one that someone else started…its like completing an item that was on their to-do list that they couldnt do…. Your quilting is wonderful. I agree – it is always fun!! Fascinated with your frame quilting. Would it be possible to video how you’re doing it? 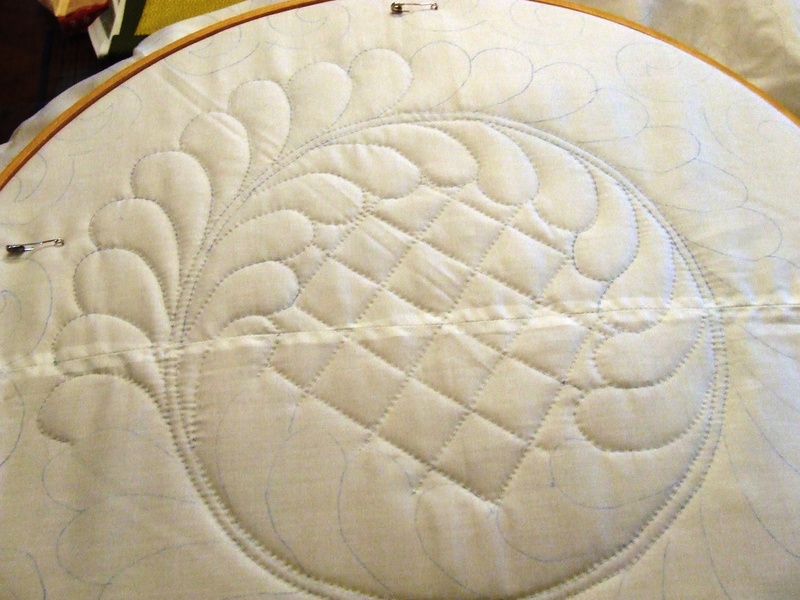 I quilt in one direction and just move the hoop as I need to change direction. How do you change direction on the frame, or are you able to quilt in all directions? Thanks. Just as long as you stay aware Tim of who is in charge!! he won’t let me forget! My schnauzer has to have order in his life too. I told my husband I could set my watch by him. Max didn’t like that I moved to sit by the window today near the breakfast table. He kept looking at the backdoor than at me behind the hoop, I had to finally get up and take him for a walk, he was right it was a nice break from quilting. 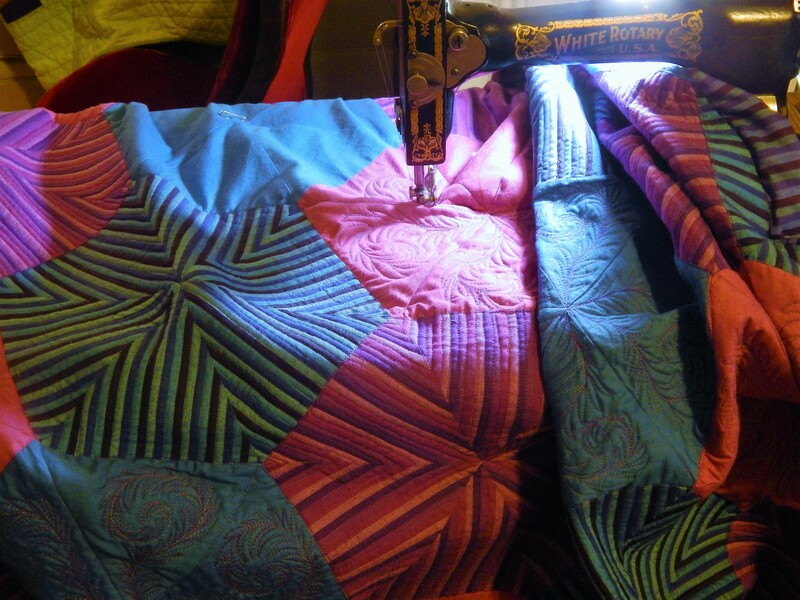 Hand quilting isn’t fast, which is why I never seem to get much done. It’s not my priority like it is with you. I tend to applique with my sit down time. But, I made a goal this year to hand quilt every Sunday, so that I can finish up a couple of quilts. Definitely, you need to get the wholecloth done to enter in the AQS show. Then, we can all get a close-up look. Hilarious! I am so glad I found your blog…not just because of Teddy but your work is so amazing and updates are full of useful hints. Thanks. I think Teddy has you firmly under his thumb/paw! 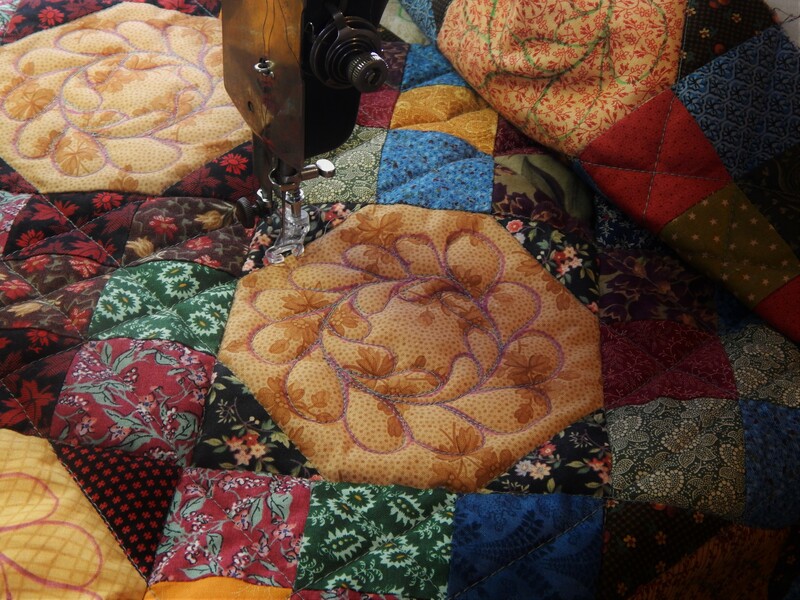 Your quilting is amazing, thanks to Salley (above) for sending me the link!